Passover: A Week Without Bagels. Bagels: fresh, heavenly New Jersey bagels. Passover begins this evening, and if you are a Jew of even middling observance, you don't eat chametz: anything made of leavened bread. Think of it as the Atkins Diet Week of the Jewish religious calendar. Most importantly, this is the one week of the year that Jews do not eat bagels. We eat matzoh, which is rather like eating cardboard, although if you soak carboard in eggs and scramble them you can make a tasty carboard matzoh brei. I'm speaking of Ashkenazic Jews here, of course, because Sephardim get to eat all kinds of goodies (rice, beans) during passover that are considered off limits (kitniyot) to us bagel munchers. But for a week.... no bagels. 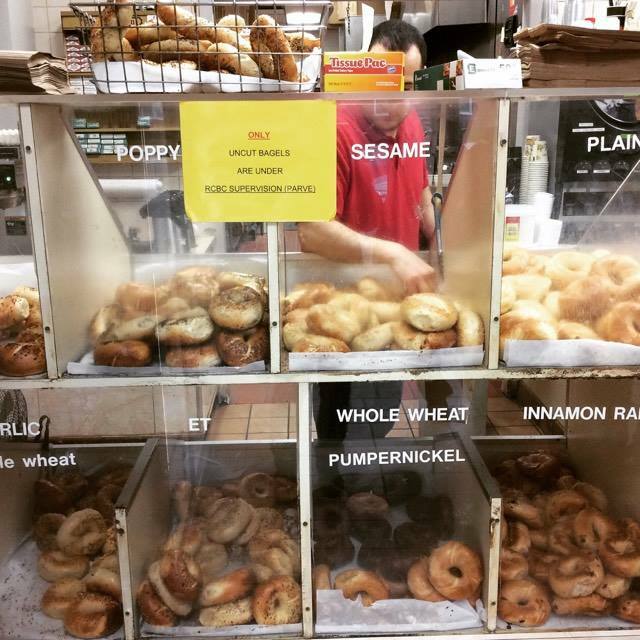 Big-holed Montreal Bagels: The only legit bagel tradition outside of New York. It has been a month since we returned to Budapest from New York and I already miss the lovely urban cesspit I was raised in. I love the NYC as well as its evil doppleganger - New Jersey - but there are things I missed there from Hungary that really make life worth living. Tomatoes that taste like tomatoes. Pork that tastes like it came from a pig. Chicken that actually once lived the life of a chicken. Mineral water with natural fizz. Mineral water with natural fizz mixed with wine. But of all the things I miss most about New York City, bagels top the list. There are no bagels in Budapest. I have heard rumors about "artisanal" bagel bakers popping up in Budapest, and there are foodie experiments at marketing various round bread things with holes in them, but there simply ain't no bagels in this town. 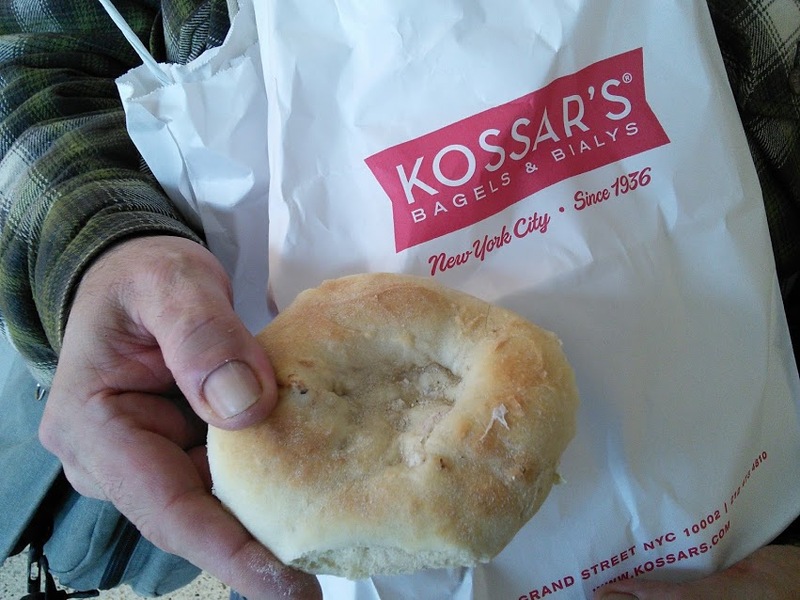 Bagels at Kossar's in NYC. New Yorkers, on the other hand, do have bagels. Montrealers have bagels. Towns and cities within a six hour commute of those places may have bagels. Other places do not have bagels. They may have bread balls with a hole in them, but not bagels. Bagels are originally a Jewish food, but in New York it has become an identity item that defines anybody who lives within a hundred miles of the city. 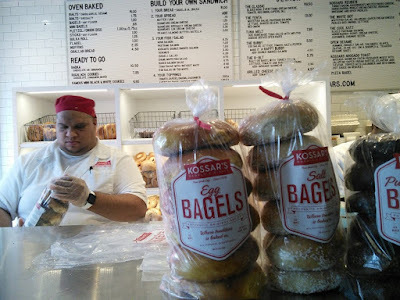 New York Jews run the spectrum from the ultra orthodox black hats of Brooklyn to the atheistic socialists of uptown Manhattan, but all generally agree on one thing: we have great bagels. 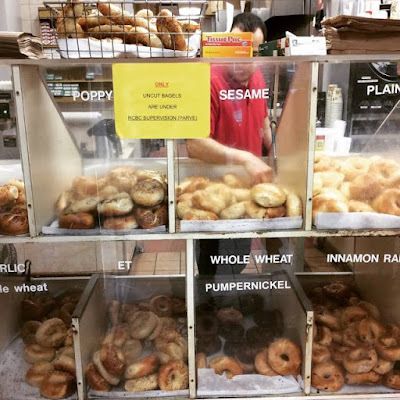 The best come from small, dedicated bakeries that churn them out fresh daily in small batches: my favorite is our local Teaneck Road Hot Bagels, in Teaneck, NJ. New Jersey has a lot of Jews: you won't get far selling an inferior bagel here. Ignore the plastic bags of supermarket bagels on sale everywhere and look for the little bagel bakeries you find in strip malls or hidden on grotty suburban shopping streets. There are gems waiting to be discovered. Teaneck is host to a large Modern Orthodox Jewish community. The Modern Orthodox community is relatively recent manifestation of Jewish atomism which has, over the last forty years has fused the Jewish piety of Rabbi R. Soloveitchik with the annoying geekiness of Jerry Lewis. Neither as isolationist as Hasidic Jews nor as prone to eat ham and marry Lutherans as Conservative Jews, the Modern Orthodox are uncompromisingly Kosher, and Teaneck is home to over 50 kosher eateries and food shops. Which doesnl't mean the food is good - just that it is kosher. The main drag, Cedar Lane, is crowded with kosher food outlets, each outdoing the next with miserable kosher pizza, laughable kosher BBQ, soggy falafuls, and disastrously sad delicatessen food for the pious and palate-impaired. With lox and cream cheese. Tip: don't order this at delis, make it fresh at home on Sunday mornings. A couple of years ago I described Teaneck this way: "I went to High School in the late 14th century. If you had to eat lunch outside of school you could afford pizza, a cheapo burger, or a deli sandwich. Jersey used to have a lot of decent delis. Teaneck had an excellent deli in Tabatchnik's on Cedar Lane. Tabatchnik's is now called "Noah's Ark" and has been reborn as an Israeli kosher place serving the modern Orthodox congregations - people whose main culinary concern is limited to "which rabbi declared the food kosher?" Overnight the identity of "Jewish" food switched from Ashkenazic Jewish to Israeli Kosher, from food to fuel. Slinging honey dipped bagels at St. Viateur Bagels in Montreal. The corned beef sandwich and kugel gave way to the falafel and chicken shnitzel, and the knish was re-purposed into a healthful vegetarian option. Knishes are not supposed to be healthy. Deli food is not supposed to be healthy. If I wanted healthy I would not be seated in a deli, popping sodium-packed pickles at a doctor-defying clip while balancing a salted cut of fatty beef in my other hand. The loss of Tabachnik's served as a emblematic lesson in the decline of Jewish delis in America in David Saxe's outstanding book about the deli tradition "Save the Deli." 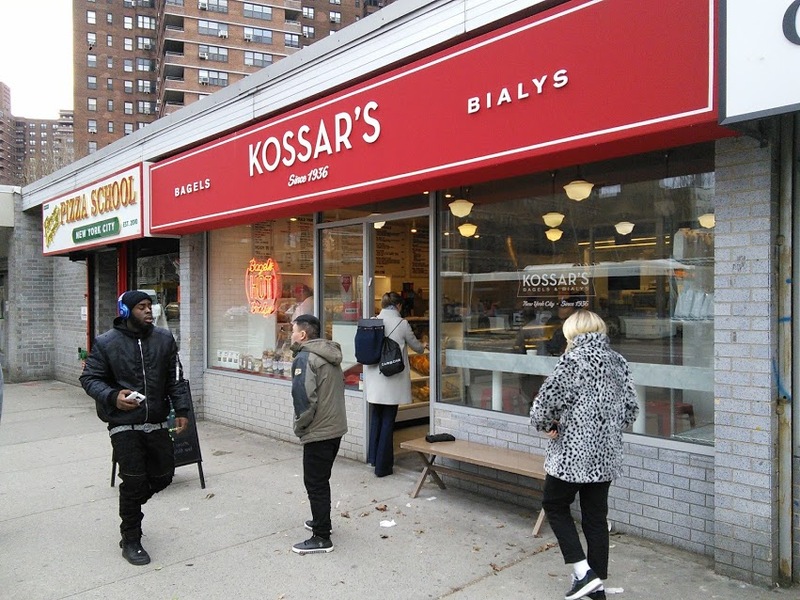 There still are a few great delis, but real estate prices and the rising cost of beef are gradually changing delis from a cheap worker's lunch into high priced "artisanal" ethnic dining. Feh! Bagel bakeries, however, can be found everywhere - in cheap strip malls or side streets, and in many places you can still get a world class food item for less than a dollar. Kossar's: 367 Grand Street on the West end of Chinatown.